Apple Watch reviews have been mixed. Some functions are unnecessary, and others take too long to learn. The $349 price isn’t too appealing either, and you have to have an iPhone to go with it. We wondered what the alternatives were, so tried out three Android watches. You have to have an Android phone. 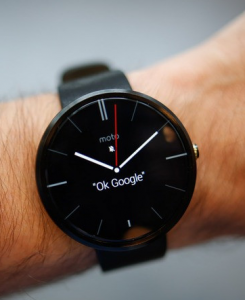 Of the three, we liked the $179 “Motorola Moto 360” best. It’s half the price of the new “LG Watch Urbane” and $20 less than the new “Asus ZenWatch.” The round-faced Urbane gets high marks for stylishness, though, with its metal rim and a handsome band. The rectangular ZenWatch is also attractive. But for Joy, our master tester, these two lost out to the less-expensive Moto 360 because Moto is less bulky. In fact, the round-faced Moto looks fine on a small or large wrist. 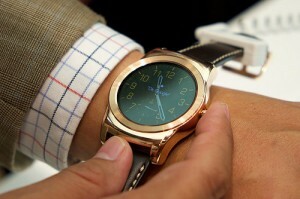 Since Android watches tend to be very much alike, you might as well pick one for looks. Here’s all you need to know about Android watches: After a few seconds, the watch face typically goes dark, that’s to save battery. The ZenWatch is a little different in that it always shows the time as well as a reminder for any upcoming appointment, which is much better. Tap to wake it up and swipe with a finger to see your text messages, the day’s agenda, email, steps walked, heart rate and other apps. Swipe right to dismiss an app. They all understand spoken commands. Saying “Wake me in an hour” causes the watch to vibrate and emit a hum an hour later. “Send a text” prompts the phone to ask “To whom?” After you give a name, just start speaking your message. “Send an email” works for brief messages. In our tests, longer messages went off before we were finished composing. “Call a car” calls Lyft, an Uber Cab rival. Here’s some more: Ask the watch: “What is the status of United Flight 440” and that info will come up on your wrist. “Call Margie’s mobile” calls Margie cellphone if she’s in your contact list. “Navigate to the nearest library (or gas station, restaurant or whatever)” starts up Google Maps on your phone, with turn by turn directions. “Call John” tells your phone to dial the number, but you can then only talk through your phone, not your wrist. Smartwatch faces are smaller than normal wristwatches, so the print is small and the messages short. The basic commands are the same no matter what Android watch you buy, but each comes with slightly different software. This is where the Asus ZenWatch shines. Its watch manager prompts you to download extras, like an “SOS” emergency call. We also installed a remote camera app. This is available on all the brands. In fact, as a general rule all the Android apps work on all the Android phones. Using the camera app, we can put our camera wherever we want, back away 20 or 30 feet, and just tap our wrist to snap a picture or start taking a video. What the camera sees also shows on your watch. This is pretty handy for spying. We also installed “ZenWatch Music,” for starting and stopping music on our phone. 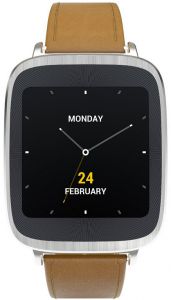 In the next Android Wear update, however, we’d like to see a few improvements. Why can’t we swipe an email into the trash, instead of archiving it for instance? (Who wants to save pitches for time-share vacations?) Why can’t we look at all our email, instead of just the last ten pieces? Despite these drawbacks, the watch made our smart phone a lot more fun. Joy fell in love with the first version she tried when she used it at an all day conference. She could secretly glance at her wrist when it vibrated to show a new email, text or reminder. This might be especially handy if a loved one needs help. A little game of solitaire would make the meeting go too.